This is one of the first of many amazing new products KavaDotCom has to offer. They don't simply micronize their Instant Kava Mix; they actually make an extract through a proprietary method, extracting the full spectrum of Kavalactones into this Instant Kava Mix so that they're completely water-soluable. Although there are over 20 lactones present in Kava Kava, many extracts focus only on Kavalactone. Not KavaDotCom. 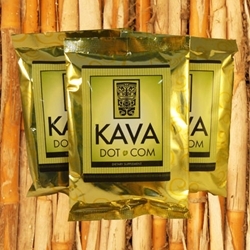 To enjoy Kava root as a powerful instant drink mix, simply tear open the foil packet, add to your favorite cup of liquid, and enjoy! Each pack of "Natural" KavaDotCom Instant Singles truly blends with any liquid (although it works best when blended with something with fats in it like milk, soy milk, almond milk, coconut milk, etc. ), and makes the easiest and quickest way to get your daily dose of your favorite dietary supplement.